Luton chief Mick Harford is glad to have goalkeeper Marek Stech available once more after his recent injury lay-off. The 29-year-old, who last played a league game back in August, unable to win his place back from James Shea, has been missing from the match day squad since the turn of the year, with youngster Harry Isted deputising. 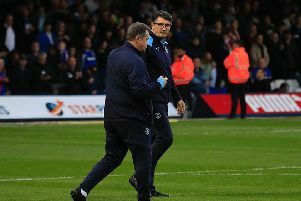 However, he played 90 minutes for the club's development side in their goalless draw against Southend United on Monday, as Harford said: "Marek had a hernia and had a recurrence of the hernia, he just had some inflammation and had to to take maybe two to three weeks off. "That’s his first game back, Southend, he did very well, so it’s good to have him back. "He's a good character around the place, a big character and big part of our squad." Stech had a starring role against the Shrimpers to keep his clean sheet, as Harford continued:: "It was a young team down at Southend, a very young team and it was good for the kids, in my opinion, to have someone of that experience around them and passing on his experience. "So Marek did a great job down there." The former West Ham and Yeovil keeper was the only senior player involved on the day and when asked why he didn't give the likes of Harry Cornick, Alex Baptiste and other members of the squad some valuable minutes, Harford said: "We could have, but we just wanted to keep them all together this week, because we’ve got a tough few weeks coming up now. "Saturday (against Rochdale) and then we play Saturday, Tuesday, two away games, long journeys, so we just wanted to keep them all together and get ready for that. “There's a good group environment, we like that, the camaraderie and the spirit. "We’ll do some top ups with the players who haven’t had many minutes, so they’ll get extra work and hopefully we’re ready for the weekend and have a real go at this lot." With Stech now fit again, it leaves just Glen Rea out, as on the rest of his squad, Harford added: "We've got one or two little niggles there, but overall we’re pleased with the fitness and health of the all the squad. "It’s challenging picking the team at the moment with a full squad. “Harry's been out for a long time, nearly eight weeks, he’s back training, he's done 10 days training now, he's looking fit and stronger. "Luke (Berry) had a bit of a spell out, but he’s back in full training, he’s back in training. “Elliot’s (Lee) trained hard, he wasn’t out for so long, he only had about two and a half, three weeks out, so he’s got back to fitness pretty quickly. "We all know Elliot’s ability and what he’s all about, so he’s back full training, he came on Saturday and made a contribution to the game, so they’re all fit and available."